3M Water Filtration Products High Flow Series Model HF20-S Replacement Cartridge provides you with Recipe Quality WaterT for consistent quality ice that can help make any beverage look more appealing. Our replacement cartridge also helps to protect your equipment from the potentially harmful build-up of scale, which can decrease production and profitability. 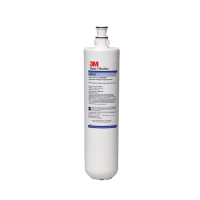 Our 3M Water Filtration Products High Flow Series Model HF20-S Replacement Cartridge is designed to be effective at reducing sediment, chlorine taste and odor, cyst and scale allowing you to feel more confident in the quality of the products you serve. The Sanitary Quick Change (SQC) design allows for fast and easy cartridge change-outs that are sanitary by design - requiring no contact with the filter media during cartridge change-out. Dimension: 15-1/4" H. x 10-1/2" Dia. Dimensions: 15-1/4" H. x 3-3/4" Dia.